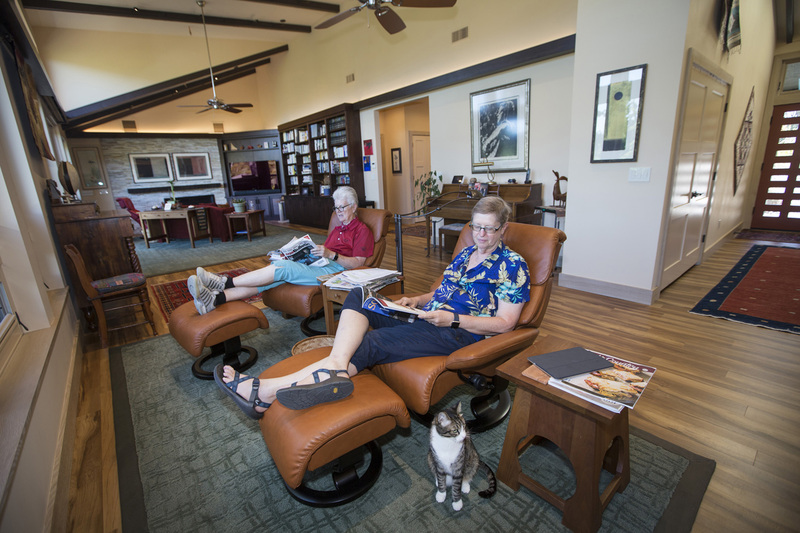 Iris Harrell and her partner, Ann Benson, relax in their chairs facing Hood Mountain in their living room in Oakmont Village. Within their fully ADA compliant home Iris remodeled herself, she added an elevator, a walk-in closet, a guest wing, and raised the roof and ceilings for a full view of the mountain range. Iris Harrell, a retired contractor from Silicon Valley, is the lead chairperson on the Oakmont Village construction committee overseeing the redesign of the entire East Rec Center. Santa Rosa, California.